Big tobacco companies were relatively slow to enter the U.K. e-cigarettes market; but they have made up for lost time by using their size and financial power. The unexpected rise in e-cigarette’s popularity took the tobacco companies by surprise. Every one of the big four companies — RJ Reynolds, Philip Morris International, Japan Tobacco International, and Imperial Tobacco — now has e-cigarettes, either already in the market or in development. However, most of the innovation has not been in-house, but through the acquisition of smaller private companies. Since 2013, a flurry of deals in the e-cigarette industry has been witnessed in the U.K. and the world over. Lorillard, the third largest cigarette manufacturer in the U.S., acquired premium e-cigarette maker Skycig to enter the U.K. market; however it was later sold to Imperial. BAT launched an e-cigarette Vype, through the purchase of a start-up, CN Creative. Philip Morris International teamed up with Altria to sell the latter’s electronic cigarettes outside the United States. It also acquired U.K.-based Nicocigs to gain an immediate entry to the market. Many other such deals have taken place; such as Japan Tobacco International’s take-over of E-lites, and the purchase of Dragonite by Fontem Venture, Imperial’s electronic cigarette arm. 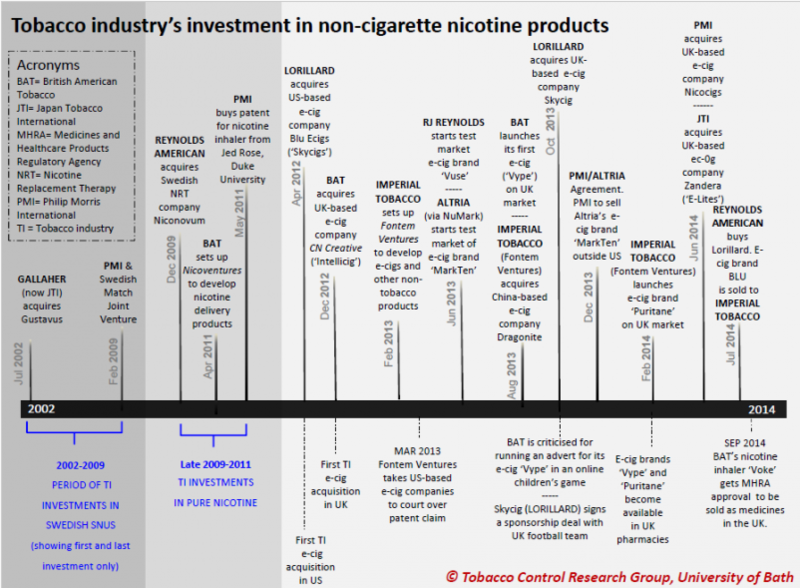 While some smaller companies see the presence of big tobacco manufacturers as a lucrative opportunity to be bought out, others find their tactics highly aggressive. Due to the relatively recent entry into the market, many consider the big tobacco products to be less advanced and inefficient. However, they have access to massive advertising and marketing budgets for their products, as well as the ability to buy smaller companies with existing products in this industry. Further take-over activity can be expected in the industry, as the e-cigarette market continues to grow. On the other hand, tobacco companies can also undertake sizeable investment into developing their own brands or wait till sufficient research is done regarding the safety of such products. The sales of conventional tobacco products are on the wane in U.K., and market experts believe this decline to continue over the next few years. Until the widespread prevalence of e-cigarettes, there had not been any direct competition to traditional cigarettes as such, with nicotine replacement therapies not providing any significant rivalry. The growth in U.K. cigarette sales was less than 1% in 2014, and that too was because of a rise in prices. Anti-smoking campaigns, a ban on smoking in public places, and increasing health consciousness have been the major factors for this trend, which are considered as the greatest threat to the tobacco industry currently. Alternatively, the growing popularity of e-cigarettes can be regarded as a golden opportunity for the industry to diversify into this market. Consequently, the revenues from this segment are poised to witness a sharp growth in the coming years. According to many experts, the sales of e-cigarettes will surpass that of conventional tobacco cigarettes in the next decade. This seems like an obvious change given the increasing regulations on the tobacco industry. However, the key question here is if such products can actually be turned into an opportunity for tobacco manufacturers, as many may need to revamp their entire business model. The e-cigarette market has been in rapid expansion mode for the last couple of years, forcing big tobacco companies to enter this segment and meet the swelling demand. While such products only form a tiny percentage of the revenues currently for big tobacco companies, their sales have increased swiftly, with those of tobacco declining. There has been a marked decline in the prevalence of people smoking cigarettes in the country; however, the rate of decline has been slowing recently.